Have you been injured in a motorcycle accident in Iowa? What should I do if I can’t work after my accident? After a motorcycle accident in Des Moines, these are the questions many victims bring to Iowa law firm Walker, Billingsley & Bair. Our legal team has been handling these types of injury cases for years and has the answers you need to determine the next step when seeking justice after a negligent driver causes an accident with your bike. a negligent driver slams into your vintage Honda at the junction between Highway 30 and I-35 in Ames. If you find yourself facing one of these scenarios, what is the first thing you do? Get the right information about your motorcycle accident. Negligence laws are complex. It can be confusing and frustrating to figure out. The attorneys at Walker, Billingsley & Bair will talk with you for FREE about your accident case. You can learn a lot from someone who has handled hundreds of car accident cases. The Iowa law firm of Walker, Billingsley & Bair believes you deserve compensation when injuries caused by a negligent driver leave you injured physically, financially and emotionally. We know that dealing with the aftermath of a serious motorcycle accident in Iowa is a sensitive time, so we don’t want to pressure you into making a legal decision just yet. To ease victims into the often frustrating world of motorcycle accident claims, we’ve written a free guide to Iowa motorcycle accident cases and what you can do to avoid damaging your claim with the insurance companies. 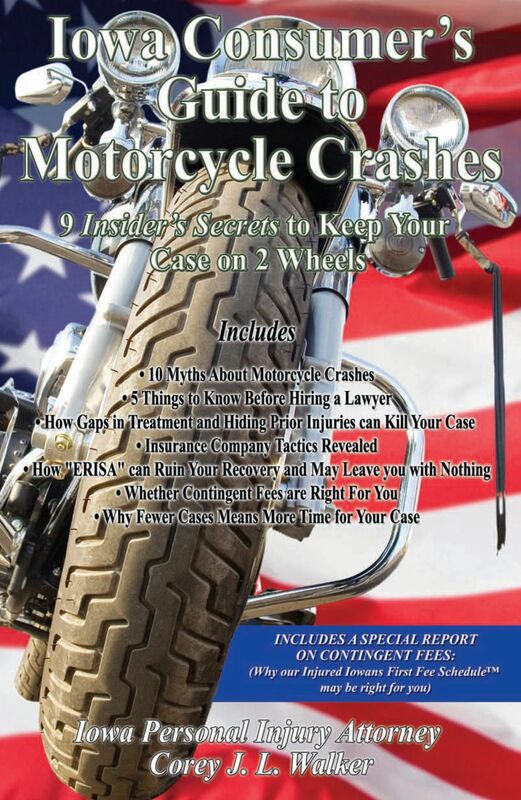 FREE Book About Motorcycle Accidents From Our Iowa Law Firm! If you or someone you love has been injured in an Iowa motorcycle accident, then you should request our motorcycle injury book at no cost, risk or obligation. Just click on the book now or call 800-707-2552, ext. 815 (24 Hour Recorded Message). Before you sign any documents for the insurance company, hire an Iowa law firm, or make a mistake that could hurt your case, you should educate yourself by requesting our Book at no cost, risk or obligation!! The accident and injury lawyers at Walker, Billingsley and Bair handle motorcycle and ATV accident cases throughout the state of Iowa. We have staffed offices in Des Moines, Ankeny, Marshalltown and Newton and appointment only offices throughout the state. We want you to know your rights and responsibilities before you talk to any law firms in Des Moines, Iowa. Personal injury attorneys Corey Walker, Erik Bair and Joanie Grife make up the motorcycle accident and injury team at Iowa law firm Walker, Billingsley and Bair. They've seen too many viable motorcycle accident cases damaged because Iowa victims didn't have the right information. Also, whether you hire us or not, our mission is to educate Iowans about Iowa's motorcycle laws because we have seen firsthand how sometimes good people are treated badly by insurance companies. Most motorcycle accidents involve a collision with another vehicle, usually a passenger car. These accidents are mainly caused when the driver of the car fails to see or properly react to the motorcycle. Wear protective clothing when you ride, including a good helmet. Be visible. Make sure your signals and lights are in working order, allow cars enough space to see you, and consider wearing reflective clothing. Regularly review safe riding tips. Avoid riding in dangerous road or weather conditions. Our Iowa law firm has seen it dozens of times - insurance adjusters trained to pay as little for your motorcycle accident claim as possible. They have an entire company on their side; you should have a law firm like us on your side, too. Our attorneys will explain the legal process to you, return your calls promptly, and use the latest computer technology to efficiently manage your case and communicate quickly and effectively. For immediate assistance call Corey Walker for a motorcycle accident in Newton at (888) 435-9886 or Erik Bair for a motorcycle accident in Des Moines at (888) 435-9886 or fill out our online contact form and get the information you need.